Sawgrass® SubliJet™ HD Ink, Magenta, fits the Virtuoso 800SGSYS printer only, sold separately. Extended Capacity 68ml Cartridge. High Definition Dye Sublimation Ink - 12% more dye. This ink does NOT fit the SG 400 printer. 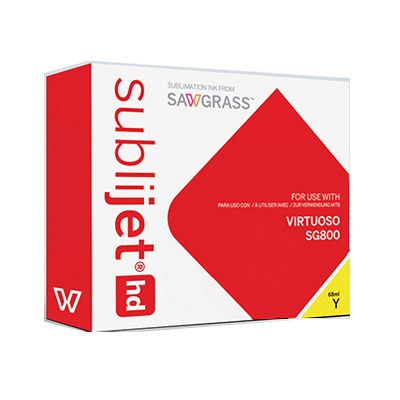 Yellow Cartridge Sawgrass® SubliJet-HD Ink, fits the Virtuoso 400SGSYS and the 800SGSYS printers, sold separately. Regular Capacity 29ml Cartridge. High Definition Dye Sublimation Ink. Magenta Cartridge Sawgrass® SubliJet-HD Ink, fits the Virtuoso 400SGSYS and the 800SGSYS printers, sold separately. Regular Capacity 29ml Cartridge. High Definition Dye Sublimation Ink. Black Cartridge Sawgrass® SubliJet-HD Ink, fits the Virtuoso 400SGSYS and the 800SGSYS printers, sold separately. Regular Capacity 42ml Cartridge. High Definition Dye Sublimation Inks.